The setting is an upscale hotel ballroom. On a stage in the center of the room sit two crystal-clear transparent pianos, facing each other, and a mic stand. In a circle around the stage, facing inward: an audience. We’ll come back to them in a minute. An octet and backing band occupy sub-stages on opposing walls, but no one’s looking at them; everyone’s gaze is fixed on the guy at the piano and the guy with the mic. They are Yoshiki and Toshi from X Japan. Yes, while the now-middle-age visual-kei pioneers’ natural habitat is the stadium, Yoshiki Hayashi and Toshimitsu “Toshi” Deyama sometimes perform at highly lucrative dinner shows. This one, held a few months ago at the Tokyo Prince Park Tower hotel, was for an audience of just 1,000 — a tiny fraction of the 45,000-capacity Tokyo Dome crowd X Japan usually entertains. For the privilege of an intimate audience with these usually hard-rocking visual superstars — Toshi crooning soulfully as Yoshiki alternates between pianos, ensuring everyone gets a gander — these diehard fans, who have grown up with the band and are now moneyed and middle-class, will have parted with ¥45,000-¥100,000 per ticket. They wear dress suits and evening gowns. After all, visual-kei fans relish any excuse to dress up. “If you always play in front of 100,000 people, you forget how lucky you are,” says X Japan drummer, pianist, songwriter and cofounder, Yoshiki, one of the most successful and influential rock musicians in Japan, as we chat in an adjacent function room after the show. He speaks almost perfect English, having lived in Los Angeles for many years — he moved there after X Japan split up in 1997, though the band got back together a decade later. In Japan, Yoshiki can’t walk down the street without being mobbed: His baby-soft skin, salon-perfect hair and ever-present shades give him away in an instant (even in his mid-40s, Yoshiki wouldn’t look out of place in a “Twilight” movie). He once told an interviewer that he moved to L.A. because he missed being able to go out to buy ice-cream. And yet here he is, with the re-formed X Japan, trying to break the States; to achieve world fame; to ditch his anonymity all over again. 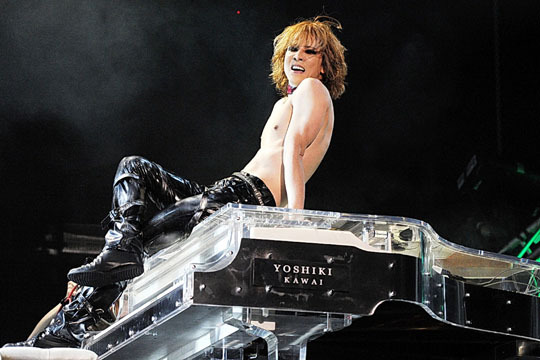 “I love the challenge,” he says of X Japan’s 2011 world tour, playing “small” venues that hold between 2,000 and 6,000 fans in places the group could never have played before it split — in Britain, South America, Asia and the United States. Nearly 30 years after its inception, X Japan is basically starting all over again in those markets. But Yoshiki craves the attention, and despite being a voting member of the Grammy panel and mates with Marilyn Manson, he knows he’s not yet a household name outside of Japan — and he wants to be. He wants to be, and so he’s working for it. But if he were to attain genuine global stardom — the sort “enjoyed” by Michael Jackson or Madonna — wouldn’t he lose the ability to buy ice-cream all over again? Yoshiki has already outshone his bandmates, finding success not only as a solo performer while X Japan was on ice but also as producer of such bands as Dir En Grey, and as an entrepreneur. He now has his own Hello Kitty doll (Hello Yoshikitty), a branded Visa credit card and a line of kimonos (Yoshikimono) that he debuted this year at Asia Girls Explosion, in collaboration with Tokyo Girls Collection. Of course, it all hinges on the music — and that’s where things get sticky. In January 2011, X Japan signed a North American distribution deal with EMI and announced its first album since 1996’s “Dahlia” — the band’s first to get a global release. The typically epic six-minute single “Jade” followed in June (it was originally slated for March 15, but was delayed following the Great East Japan Earthquake on March 11), gracing the iTunes Top 10 in several countries. The album, however, has yet to materialize. You can forgive Yoshiki and co. for taking their time. The fans have waited 15 years already, so what’s a few more months? It’s important to get this album right, because most of X Japan’s intended audience — average Joe American — have no idea yet who the band is. Whether or not the genre goes mainstream in the West, visual-kei is already a global force, with Japanese bands such as Dir En Grey and L’Arc-en-Ciel pulling large crowds overseas, and local bands even forming in other countries. While X Japan was out of action, Yoshiki lent his support, organizing Stateside concerts to help younger visual-kei bands (most of whom held X Japan as a major influence) to gain traction there. It was a shrewd move — soon X Japan’s back catalog was notching up worldwide sales by association, and when the band re-formed, it had a new audience already waiting. “Without bands like Dir En Grey introducing the visual-kei genre abroad, I don’t know that we could have done this year’s world tour,” admits Yoshiki. “I really have to thank them. In shirking the conventions and the constraints of rock music, Yoshiki and pals have not only made their millions: They’ve helped reshape Japan’s and the world’s perception of Japanese pop culture. Not bad for a bunch of blokes in makeup, right?